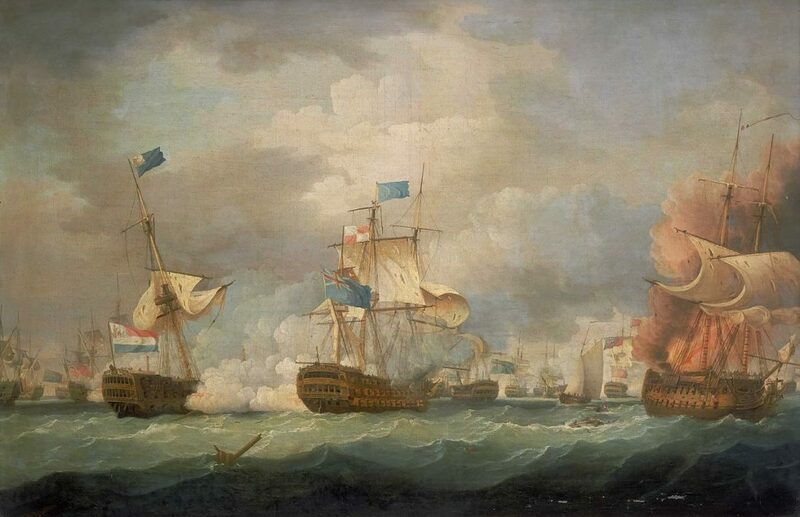 The Revolutionary and Napoleonic Wars locked Britain and France into almost twenty-two years of continuous warfare from 1793 and conflict at sea was a critical part of this. What is surprising however is how few ships were actually destroyed in combat. Whether in large fleet actions or in “single ship” duels, wooden ships tended to survive very heavy damage and could often be repaired sufficiently at sea to get them to port. When captured, such ships were often to get a new lease of life in the victor’s navy. Little use was made of explosive projectiles and though solid shot could inflict severe structural injury above the water-line, it seldom caused outright sinking. The relatively few ships that were lost due to combat mainly succumbed to magazine explosion, or to burning. The greatest threat to a wooden warship’s survival came from stormy weather, especially if it were to be cast on a lee shore, where it could be battered to matchwood. 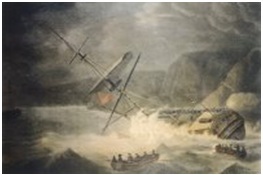 One such loss occurred in 1804 when a Royal Navy “74”, HMS Venerable, encountered disaster. Built in 1784, the Venerable had played an important role at the Battle of Camperdown in 1797, assisting in the capture of the Dutch admiral’s flagship Vrijheid. Much of Venerable’s service – like that of so many other 74s – consisted of participation in the blockade of the French coast – gruelling work, often in atrocious weather conditions, that continued day-in, day-out for months on end. This was never more the case than in 1804-05 when fears of a French invasion were at their height and the Channel Fleet, under Admiral William Cornwallis (1744 –1819) represented Britain’s first line of defence. On 24th of November, 1804, the Cornwallis’s fleet, including Venerable, lay in the large anchorage at Torbay, in Devon. Deteriorating weather conditions, and an onshore gale, caused orders to be given to put to sea. Venerable was under the command of Captain John Hunter (1737 –1821), whose portrait is shown on the left. 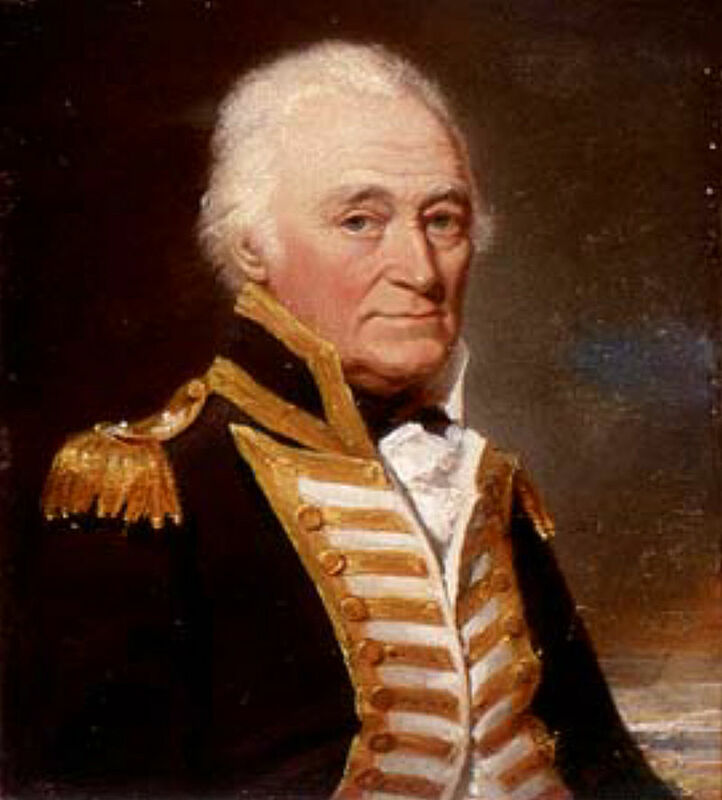 Hunter who had not only had an active naval career but had also served from 1795 to 1800 as the second governor of New South Wales, Australia. There he encouraged exploration and his name is commemorated in the Hunter Valley, north of Sydney. As governor Hunter combatted serious abuses of power by the military authorities. In this period a contemporary described Hunter as “devoid of stiff pride, most accomplished in his profession, and, to sum up all, a worthy man.” He is also notable for having sent back to Britain the first known sketch and pelt of a platypus (of which Dr. Stephen Maturin would certainly have approved). Darkness was falling as Venerable began raising anchor. The operation went awry however, one seaman being thrown into the sea. The alarm was given and orders were given to drop a cutter to rescue him. In the process one of the falls suddenly let go and the cutter plunged down into the water and filled. A midshipman and two seamen were drowned but a second cutter managed to rescue others in the water, including the man who had originally fallen overboard. Venerable’s plight had not gone unnoticed. Two other 74s, Goliath and Impetueux, approached as closely as they dared in the circumstances and a cutter, HMS Frisk, stood in nearer still. Frisk was requested to anchor as close to Venerable as she could so as to receive survivors, carried to her by pulling boats from Goliath and Impetueux. Discipline prevailed as Venerable’s crew were transferred to the boats and Captain Hunter, and his officers, declared that they would not leave the ship until the last seaman had been taken off. (It should be noted that at this time Hunter was sixty-seven years old, but this did nothing to decrease his resolution). The sea conditions were now so bad that the rescue boats could only come in under Venerable’s stern, from which men were lowered by ropes. These efforts continued through darkness, raging seas and driving sleet. Venerable was now practically on her beam ends, such that Hunter and his officers were now directing operations while standing – or rather holding on – on the outer side of the hull. All this time Venerable was pounding on the shore and likely to break up at any moment. It was close enough to the land – some twenty yards –to shout to helpers on shore and a line was eventually secured between them and the ship. Several men attempt to haul themselves to land along it but were plucked away to their deaths by the surf. By five o’clock on the morning of the 25th – still dark and with the weather deteriorating yet further – only seventeen seamen remained on the ship with the officers. The sea was breaking over them and the fore part of the ship was wholly submerged. Only then did Captain Hunter order the final evacuation, his officers and himself to follow the men. One by one they dropped into the waiting boats – whose crews had by now been inaction in the most dangerous conditions imaginable for more than six hours. Ultimately all, including Hunter himself, were brought across to the Impetueux. This was none too soon – shortly afterwards the Venerable broke apart amidships and the part they had been huddled on capsized. Within sixteen hours of first striking nothing remained of the ship but driftwood. It is pleasing to note that Hunter, when court-martialled for the loss of his ship, as he had to be, was fully acquitted. He promoted to rear-admiral two years later and to Vice Admiral in 1810., and then to vice-admiral on 31 July 1810, though he never hoisted his flag at sea. He died in 1821.